It is normal to feel like giving up on everything, feel sad and empty when one experiences very challenging situations in life such as relationship break-up, loss of one’s loved one or job loss with so many financial responsibilities to meet. Normally, these feelings don’t persist for long and within a few days the person brightens up to face the reality and actively look for ways to forge ahead and survive. However, when these feelings last more than 2 weeks, get worse with each day that passes by and causes the person discomfort–such as loss of appetite, affect his or her relationships, feeling of guilt or worthlessness without any reason or strong thought of committing suicide–it is a sign that depression has set in and the person needs help. How does a person with depression get the right help? Women are more likely to seek help than men because men tend not to open up. So it is more difficult to spot depression in a man until it gets out of hand in the form of an attempt at suicide. 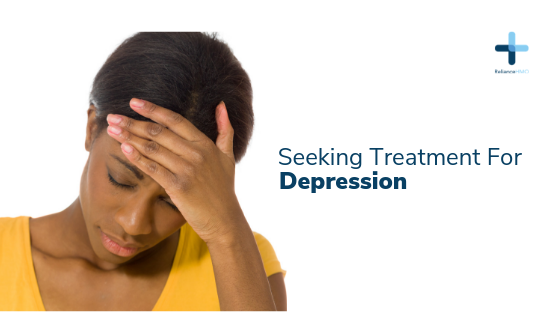 Depression is treatable, but it must be detected early to get the best treatment outcome. It’s possible for one to be unaware that one has depression (this is called poor insight). In this case, such a person should pay attention to the changes in how people relate with him or her and compare these changes with their relationship with their responses in time past. If you withdraw yourself, don’t eat, lose total interest in your partner, no longer sleep, don’t hang out and always feel sad consistently for weeks, people around you will likely change in how they relate with you. This should at least make that person question the reason for this new look on life he or she now has and ask someone they can trust (their reverend father, pastor, imam or a family doctor) whether it is normal or not. Or if such a person has issues with discussing a private matter with anyone in the immediate environment, he or she can search online for Kangpe where he or she can confidentially ask a certified doctor questions about these new feelings and state of mind. In addition, try indulging in exercises such as early morning jogging during which you plug your ears and jam your favourite songs. Doing this every day will help you get over some of the negative feelings. Another reason that prevents people with depression from speaking out is the stigma attached to mental health issues and the various bad names in local languages (“werey” in Yoruba and “onye ara” in Igbo) given to different mental illnesses by various tribes. As a husband, wife or a co-worker, you should know that mental health issues are like medical conditions but of the mind instead of the body. So, it is absolutely normal for people with mental health illness such as depression to speak up and seek help just the way someone with fever and abdominal pain will complain and want to see a doctor. Therefore, be very observant of people in your environment. If you notice that your husband, wife, child, sibling or co-worker, for weeks, no longer talks to anybody, always gets angry without provocation, no longer eats, loses interest in your relationship or stops coming to work, don’t criticize them or get angry. Instead be kind to them and encourage them to openly discuss how they are feeling and suggest helping them go see a doctor. At this point, you can talk to your family doctor if you have one, or request a private appointment with a doctor in any good hospital near you and bare how you have been feeling to the doctor (if you feel like crying, cry and let the heaviness out). Any doctor will counsel you after listening to your story and probably refer you to a psychiatrist for expert treatment. A psychiatrist is not someone who treats madness. A psychiatrist is a medical doctor who specialized in the study and treatment of health challenges of the human mind of which depression is one. There’s nothing evil or bad luck about seeing a psychiatrist. A psychiatrist will ask you several questions and listen to your story as you answer these questions. The psychiatrist will also perform what is known as mental state examination which is basically a series of questions to characterize the type of mental health issue the person has. After this, the psychiatrist will administer treatment which is a combination of what is called psychotherapy (the use of discussions and specially designed activities to help a person with a mental health issue change and overcome such an issue in desired ways) and prescription medications called antidepressants.